I find myself in a grumpy, ungrateful mood this morning. I woke up elated that I didn’t have to travel on this busiest day of the year: that I don’t have to brave the snow-ice-sleet storm headed our way, that I don’t have to be scanned or patted down or put up with the protestors. I was quite content with our at-home holiday plans. Except. After a frustrating morning wherein I kept losing my temper at the child every fifteen seconds or so, I did a quick inventory of mind-body-spirit. And it turns out I really did want to go home for Thanksgiving and I am quite cranky today as a result. When I gather my wits about me, I realize that my first sentiments of the day are still quite true. I’m happy to be here with F and S; I’m happy to gather with my in-laws and give thanks; I’m happy to trek up to the family cabin (even if it’s buried in snow; even if it’s only for a day). But holidays always find me torn between here and there. I also want to be with my family and friends, in my childhood house, eating my favorite holiday foods. I want my traditions and my plans to rule the day. In theology-speak, it’s a “both/and.” Very Catholic. I am both here and there, both content and longing. Already and not yet. So today I am challenging myself to be grateful for things both here and there. The gift of love that draws us in many directions all at once is a Good Thing. I am grateful that I want to be in more than one place this Thanksgiving-tide. It means I belong more place than one. 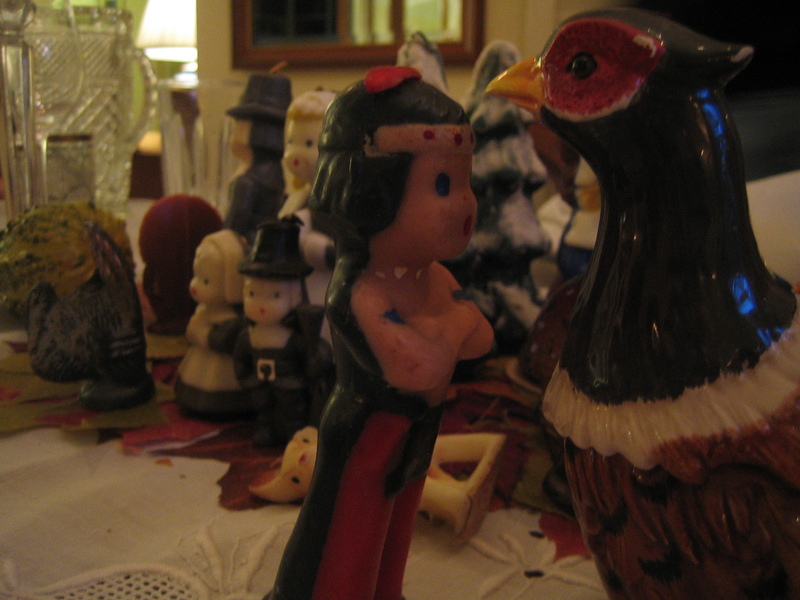 I even belong to people who find it humorous to stage showdowns between figurines in the Thanksgiving centerpiece.